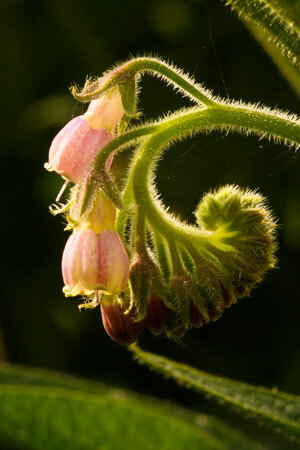 Comfrey is a vulnerary herb used for both dermatological and musculoskeletal complaints. Its common name “knit-bone” alludes to its historical use for speeding the healing rate of bone fractures, but its use extends to soft tissue trauma as well, such as muscle pain and trauma. It contains important anti-inflammatory compounds, and research supports that topical application may benefit those suffering from arthritis and back pain. In addition, comfrey is a common ingredient in cosmetics and skin creams, used to decrease irritation and inflammation of the skin resulting from eczema and dermatitis. Research suggest it may help heal leg ulcers. Caution: Historically comfrey was taken orally for gastrointestinal complaints but now it is exclusively used topically because Health Canada and other government organizations have banned the internal use of comfrey. Comfrey contains hepatotoxic compounds (pyrrolizidine alkaloids) that cause liver damage when consumed orally.